I will teach your child the language of music. My teaching curriculum is geared to the individual learning needs of each student taking also into account personal wishes, because everybody is different. My studio is well looked after and offers a pleasant and positive learning environment as well as a wonderful grand piano with rich sound and extraordinary dynamic range to give free rein to creativity and joy for music. Above all I teach with a single purpose: To help you express yourself through music and to give voice to that which you might not be able to put into words. You or your child arrive on time for each piano lesson, are well-prepared and bring your sheet music or records with you. Daily quality practice is required and absolutely necessary for your learning progress. To create a suitable routine, you should actively support your child. Please ask questions if you or your child do not understand assignments. mandatory, I encourage participation for various reasons. Everyone must have access to an acoustic piano, preferably at home. 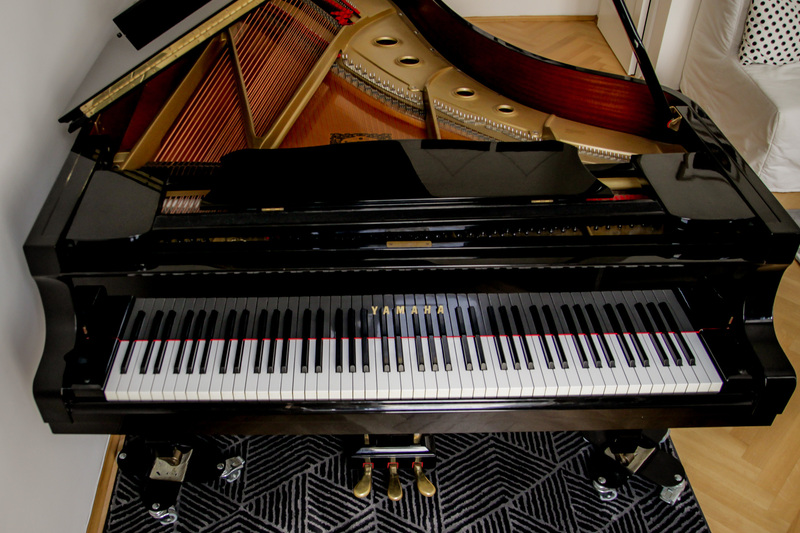 Keyboards are not accepted, digital pianos with 88 weighted keys are allowed, but do not offer the rich sound and dynamic range of a real piano. Piano lessons take place weekly in my studio at Seidengasse 44, 1070 Vienna as individual private lessons. For 4-5-year-old children, group lessons are also possible as a playful preparation. No classes are held during Viennese school holidays and on public holidays. If your child has different holiday periods, it is unfortunately not possible for me to take that into account. Please keep this in mind before registering. During the summer holidays (July + August) you can book 4 lessons with a summer subscription. The tuition fee for a whole semester is paid in 5 installments and is due every 5th of the month. You can also make a one-time payment for the entire semester at a reduced price, in the winter semester payable by September 15th, in the summer semester by February 15th. Summer subscriptions are due July 15th. Tuition covers not only the actual lesson time spent with each student, but also preparations, research and planning of teaching repertoire, administration and correspondence, teaching experience, training, room rental, instrument maintenance and much more. The registration for the semester subscription is valid for a whole semester and is allocated according to free spots. With your registration you enter into a contract that automatically extends each semester. A cancellation is always possible before the end of the semester. If you do not wish to continue piano lessons, I ask for a written notice at least 4 weeks before the end of the current semester. In general no makeup lessons will be provided for lessons that I have to cancel. However, with your semester subscription you are entitled to at least 16 lessons per semester. If you should fall below that number makeup lessons or credits will be given. Lessons missed by the student for any reason will not be made up or rescheduled. I try to provide you with the best possible teaching time on the day of your choice. Please understand that the tuition you pay reserves an exclusive weekly time slot in my schedule. In case of cancellation on your behalf I cannot resell that time nor can I create extra teaching time in which to give lessons. creativepiano, which are published on my website or on YouTube. These recordings are helpful for other teachers or students and there is usually an exchange to obtain constructive opinions on musical or technical aspects. Please let me know if you do not want this. In general, children love to admire their achievements on my website. For publications I only use first names.